STAGING WITH PURPOSE - Decor Designs, Inc.
Have you ever wondered why builders go to such great lengths to decorate model homes? After all, they aren’t in the business of selling furniture, artwork or accessories. Of course, the answer is simple! They know all to well that you’re not just selling the box of a house, the roof, the rooms or the fixtures. They’re selling the DREAM! Shoppers buy logically based on necessity. But, generally, they justify that purchase emotionally based on how the item (in this case a house) makes them feel. Staging goes way beyond depersonalizing and decluttering a space. You have to sell the dream that living in your home (can be). That holds true even if you are finished with that dream and ready to move on. Every room in your home needs to have a clear purpose in the eyes of your potential buyers. In other words, if it’s a bedroom… it should probably be a bedroom. That’s why people are looking at your house. If they’re looking for a larger home, chances are they need bedrooms, not turtle habitats or gyms or offices. The same holds true for every space in your home. Every one of them needs to showcase how functional it can be helping the new owner to live the dream. I recently helped stage a property in Kildeer that had a unique selling conundrum. What do you do with a non-functional sauna? While a buyer might see this as a neat feature, it’s definitely a costly fix to get in working order. So what to do? 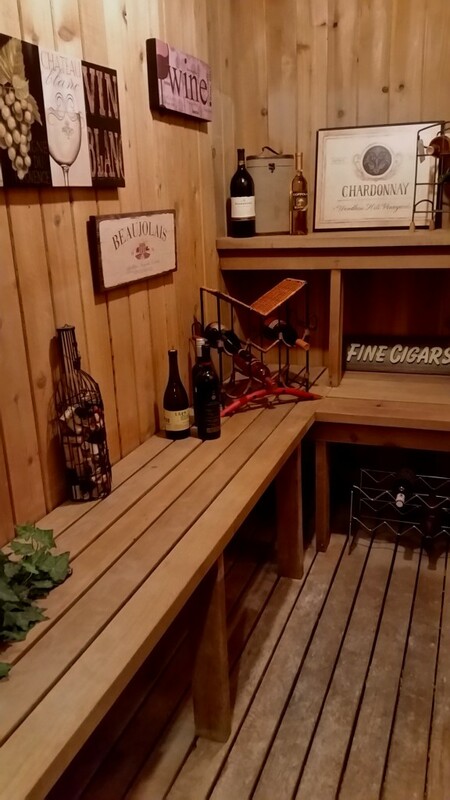 Why not turn it into a wine cellar? Just off the basement man-cave complete with bar, this potential problem suddenly has purpose and a new life as a wine storage area. With a few bottles of wine and props, the hidden potential in this space is uncovered. And the space goes from a liability to an asset for buyers. So don’t sell yourself short when selling your home! Give each space a clearly defined function that alines with what prospective buyers need to live the dream. Try to anticipate what buyers are looking for and give it to them. If you have a space that has become a catch-all or a liability, (like this sauna) give it a new purpose so buyers look past the “to-do” that could kill the deal before it even starts. This entry was posted in Decorating Tips, Staging and tagged Real Estate Staging on April 24, 2016 by Jeff Rice.